On the same day of the Chicago fire there was another fire in Peshtigo, Wisconsin. No one knows what caused it. The parents and baby sister of Ailis and Quinn died, and they were brought to live at a boarding house in Chicago. They were expected to work in exchange for being cared for. This book takes a look at the quality of life in Chicago after the fire, both the dismal and hopeful aspects. On the same day as the Great Chicago Fire of 1871, 250 miles away in Peshtigo, Wisconsin, there was an even more devastating fire. Twelve-year-old Ailis and her younger brother, Quinn, survive, but their family does not. Ailis and Quinn are taken by a family acquaintance to live in a boarding house in Chicago, where they meet six-year-old Nettie, an orphan displaced by Chicago's fire. But the woman who runs the boarding house makes their lives miserable, and Ailis vows to find a way for the three of them to leave. Ailis finds a job at a millinery shop and Quinn plays his fiddle on the streets so they can save money. Then Nettie disappears, and Ailis and Quinn discover she's been kidnapped by a group that forces children to work in the sewers killing rats. Can they find a way to rescue her? 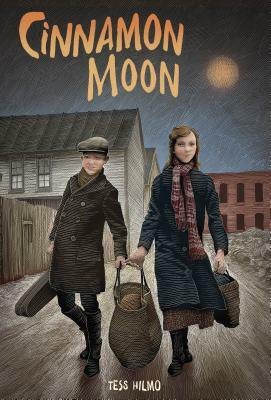 CINNAMON MOON is Tess Hilmo's riveting story of friendship and finding home. Tess Hilmo is a writer and an amateur composer who lives in Highland, Utah.